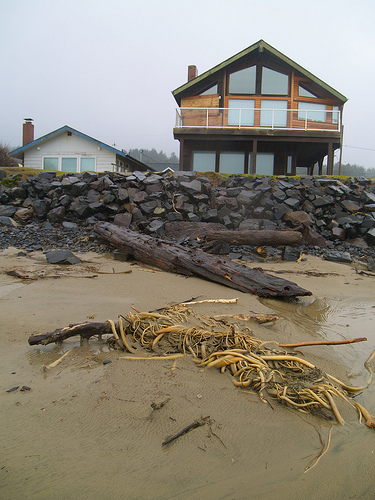 Welcome to beautiful Cannon Beach! Actually it was driving rain like you wouldn’t believe, but we had to make a choice for our drive from Portland to Seattle. Go the interior route and try to stop in and have a visit with Mount St. Helens, or go the coastal route and see what we can see. 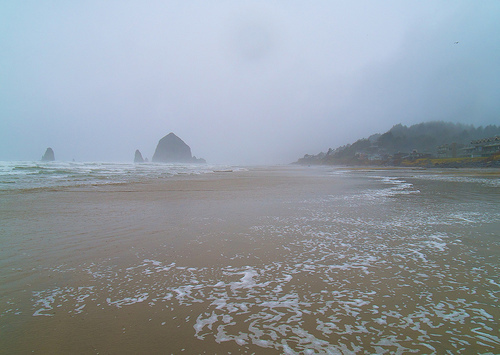 It was New Year’s Day and it was absolutely pouring out, and we figured the miserable weather would keep Mount St. Helens shrouded in fog, so Cannon Beach it was. Apparently Haystack Rock, pictured above, is a protected marine garden, and it is about 235 feet in height. And of course with the weather we had, we didn’t see any, but it apparently is also home to tufted puffins! And kelp! 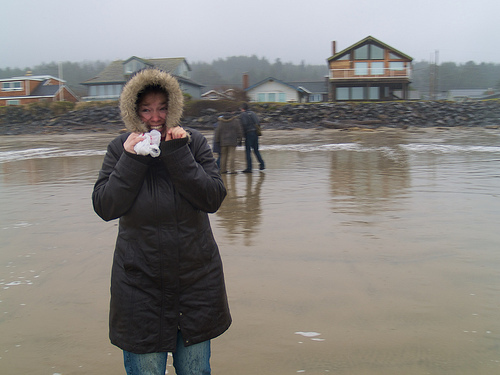 We were running around like crazy people, euphoric to have been let out of the van for a few minutes and to be at the ocean, however terribly unfriendly the weather was. I can now say we’ve been to the Northwest and Southwest coasts in the last year. Cannon Beach is a touristy little place but thankfully, because it is, lots of the shops were open on New Year’s Day. And it was pretty quiet. I’m sure during the summer the place is rammed with tourists. Even in the pouring rain and fog, I thought the beach was beautiful.